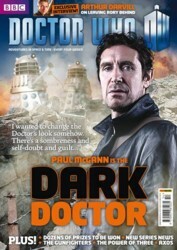 AlienEntertainmentStore.com: Doctor Who Magazine #454 - Paul McGann - The Dark Doctor! Doctor Who Magazine #454 - Paul McGann - The Dark Doctor! DWM catches up with actor PAUL McGANN to discover how his incarnation of the Doctor has changed...�There�s sombreness and self-doubt and guilt... I�m not sure it�s guilt, but he�s lost hope. He needs a shot in the arm... But of course, you don�t want him too heavy either. We want the hope. We talk about hope a lot in the story; it�s all about hope�"
Writer STEPHEN THOMPSON reveals his inner fan, endures a grilling from a tough crowd, and drops hints about his next script for the TV series, JOURNEY TO THE CENTRE OF THE TARDIS, in PRODUCTION NOTES! He's directed Sontarans and Shakri and he's back to oversee one of the episodes in the anniversary year. DWM interviews DOUGLAS MACKINNON and discovers the secrets of successfully directing a Doctor Who monster. DWM takes a close look at one of the most memorable monsters ever to appear in Doctor Who, and interviews the actor who played their spokesman, BERNARD HOLLEY, in THE WATCHER'S GUIDE TO AXOS! THERE'S GONNA BE A LYNCHIN'! THE FACT OF FICTION looks back to the very first time TARDIS took the Doctor and his companions to the wild, wild West as DWM unearths brand new facts and rare photographs from 1966's THE GUNFIGHTERS. Yee-haw! The spotlight falls on the season that featured the d�but of the Seventh Doctor, a cornucopia of crazy characters and a bold new direction for the TV series as COUNTDOWN TO 50 continues. The Doctor uncovers the incredible truth about the Golem of Prague and encounters the Queen of the Mavora, as the brand new comic strip, THE BROKEN MAN, concludes � written by SCOTT GRAY with art by MARTIN GERAGHTY. Is Doctor Who more exciting when the mosters come to Earth, or is it more thrilling when the adventure is in outer space? TOBY HADOKE and JOHNNY CANDON fight it the pros and cons in another heated BATTLE OF WITS! For one issue only, THE TIME TEAM takes a sideways step to look at Captain Jack's adventures in Doctor Who's sensational spin-off, TORCHWOOD! What will Emma, Chris, Michael and Will make of it this very different series...? The mysterious Watcher examines the curious phenomenon of 'Wrong-Time-of-Year' syndrome, challenges readers with The Six Faces of Delusion and champions another Supporting Artist of the Month, in WOTCHA! PLUS! All the latest official news, the latest DVDs, books and CDs reviewed, sneak previews of forthcoming merchandise, a prize-winning crossword, FIVE fantastic competitions and much, much more!